The most common question I’m asked about my art is, “Where do you get your ideas?” I love the written word and quotations inspire me. When I read or hear something that strikes a chord, images begin to form in my brain. Seeing an adorable child has the same effect on me. In my mind’s eye, they can sprout fairy wings or morph into a mermaid. At other times, I’m compelled to search out a quotation to describe their essence. However, my artistic process doesn’t always work that way. 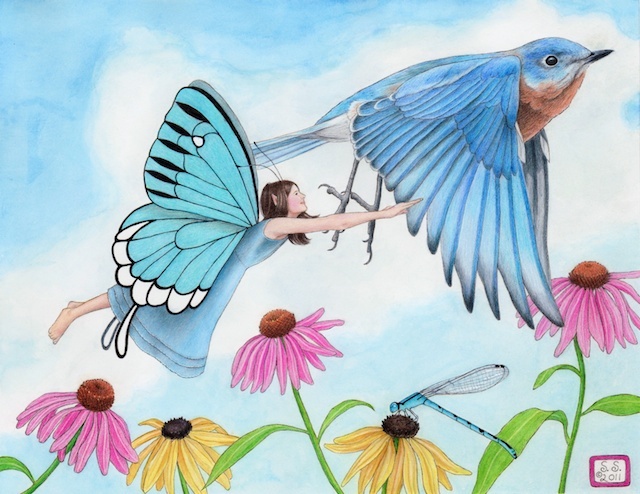 The above fairy painting is from a picture book I authored, Glory in the Morning. One day it struck me that the image not only illustrated a scene from the book but is also autobiographical. I had unwittingly brought a quote to life by Maya V. Patel that my sister Ann had given me, “She takes my hand and leads me along paths I would not dared have explored alone.” That describes our relationship perfectly. Ann and I felt we were traveling companions through our time on earth. Sometimes I would lead, and other times I raced to keep up with her. I now see my watercolor as a metaphor for our lives. In it, I’m the fairy soaring with my sister, the bluebird. Together we traverse the garden like the characters in my book. Because Ann died suddenly in 2009, the flight of the bluebird takes on an even deeper significance. Giving credence to the words of author J.M. Barrie, “Death is but the next great adventure,” I no longer grieve. Clinging to my sister would only serve to weigh her down. Inspiration is a wondrous and mysterious thing. 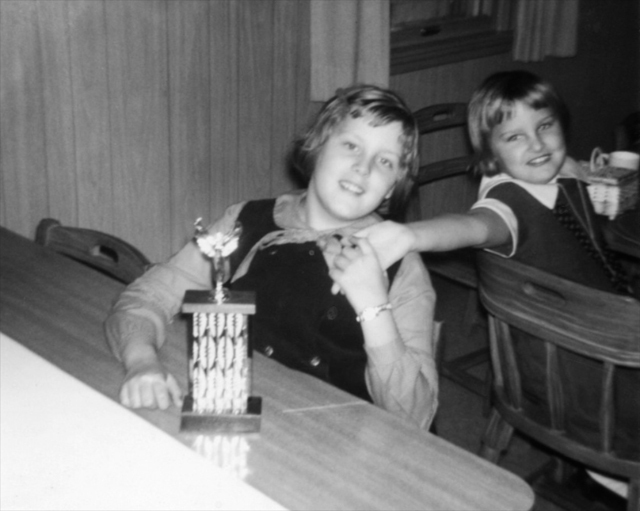 Me with my sister Ann, hand in hand, at the beginning of our journey. Text and images © Sue Shanahan. All rights reserved. Watch for my new children’s book app, Glory in the Morning, coming to the iTunes store in September. Thanks. The minute I knew Ann passed I knew I was so lucky to have been able to dance through life with her as long as I had. I love your pictures, they are inspiring by their self. I love it when God gives us little treats, of a picture or an experience in nature. It also makes it easy to write about. God gives us what we need if we would just look and see. Thank you for sharing. Lois, what lovely words you shared. They make me want to keep painting, writing and sharing.